I love the Portland food scene because of all the great amazing food we get to indulge in, every day if we choose. Behind every successful restaurant there is a story about how they got there. As we walk in and out, having enjoyed our time, we never get to hear those stories. How would you like to hear some of those stories and get some of the recipes of some pretty spectacular restaurants in Portland, Central Oregon and Seattle? 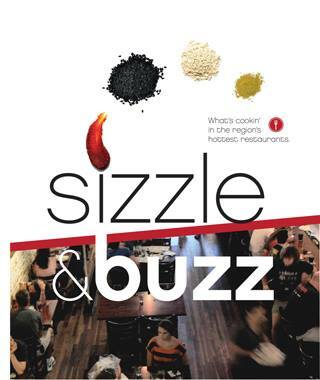 Sizzle & Buzz is written by those that put out The Where to Eat Guide. They have done an excellent job. Of the 11 restaurants in Portland that they highlight I have been to 7 of them. I have to honestly say I had no idea what the stories were behind each of these places. It made my favorites, even more favorite! I also love that the chefs were willing to part with some pretty amazing recipes too. The best part about this whole recipe book is that a portion of the proceeds are to help stop hunger. The founder of The Where to Eat Guide, John Herbik, shares in the book why this is a cause that really tugs at his heart. Here’s your chance to win this recipe book. You can keep it for yourself or you can give it to someone who really loves the Portland, Central Oregon or Seattle food scene. Maybe you don’t want to wait to win it, maybe you just need it today. Then head over to Sizzle & Buzz to order your copy now and support a good cause. Follow The Where to Eat Guide on Facebook and see where else you can get copies. Leave a comment below or on Facebook letting me know if this is a gift you would keep or giveaway? And why? Maybe your answer is both. This Giveaway will close on Sunday night and I will announce the winner on Monday. Good luck! This contest is now CLOSED. Ryan you have won. Please contact me. I need this so that if a hipster somehow stumbles upon my humble abode, I have something cooler sitting on my kitchen table than anything they could possibly have. It wouldn’t be sitting there to be cool though, I would actually have wine glass rings and truffle butter stains through-out the pages, because I probably am using it every freaking week. So there… that’s why I need this book. I would share this book with my 20 year old college junior son who has refilled my once empty nest. He actually washes the dishes as well as making them dirty, and his culinary adventurousness is expanding all the time. He loves me to cook for him and I love him cooking for himself even better, but I do indulge him (re: aforementioned dish duty). This would be a great addition to the kitchen for mother-son cooking inspiration. I would give this to my mother as she is a cookbook horder and she needs “Sizzle And Buzz”. It is missing from her collection which is epic. Come to think of it , I would need one too. I want to cook amazing foods!! Can I Have one?? *”Win win situation ” is what I meant to write !! I would love ti have this book! My mom and I try to go to a new restaurant once a month. I want to find all those wonderful food spots and would like this for myself. I’d keep it and use it to find new favorite dining spots in Portland…but of course share it with friends/family too. I would love to give one to my sister so we can explore great places to eat in and around Portland! !